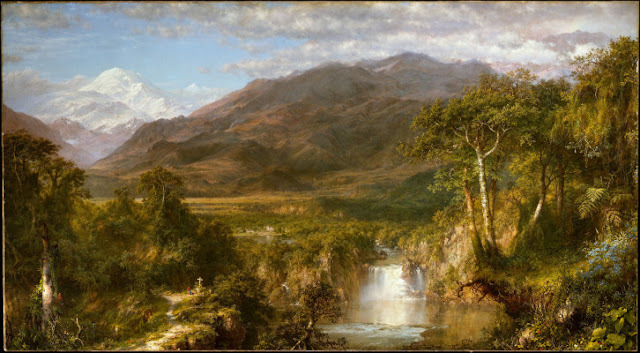 Humboldt was the first to explain the fundamental functions of the forest for the ecosystem and climate: the trees’ ability to store water and to enrich the atmosphere with moisture, their protection of the soil, and their cooling effect. He also talked about the impact of trees on the climate through their release of oxygen. The effects of the human species’ intervention were already ‘incalculable’, Humboldt insisted, and could become catastrophic if they continued to disturb the world so ‘brutally’. Others feared his sharp tongue so much that they did not want to leave a party before Humboldt departed, worried that once they had gone they would be the object of his snide comments. Some thought Humboldt was like a meteor that whizzed through the room. At dinners he held court, jumping from one subject to another. One moment he was talking about shrunken heads, one acquaintance remarked, but by the time a dinner guest, who had asked his neighbour quietly for some salt, had returned to the conversation, Humboldt was lecturing on Assyrian cuneiform script. Humboldt was electrifying, some said, his mind was sharp and his thoughts free of prejudice. Coleridge [lamented] the loss of what he called the ‘connective powers of the understanding’. They lived in an ‘epoch of division and separation’, of fragmentation and the loss of unity. The problem, he insisted, lay with philosophers and scientists such as René Descartes or Carl Linnaeus, who had turned the understanding of nature into a narrow practice of collecting, classification or mathematical abstraction. 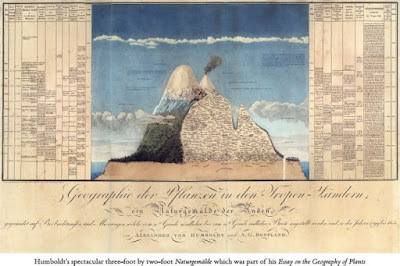 Lord Byron immortalized Humboldt in Don Juan, ridiculing his cynometer, the instrument with which Humboldt had measured the blueness of the sky. O, Lady Daphne! let me measure you! However, classification wasn’t what he was interested in. ‘Individual phenomena were only important “in their relation to the whole”’. He wanted to show how things worked together: he ‘“read” plants as others did books – and to him they revealed a global force behind nature, the movements of civilisations as well as landmass.’ Expressing this lyrically was part of his method, branching out into artistic expression as a way of broadening his scientific perspective (Wulf recommends Views of Nature as a good place to start reading Humboldt). Beginning to understand how this global force worked led to an understanding of how plantations and monoculture disrupted it, and he was in favour, along with American president Thomas Jefferson, of subsistence farming, as a way of maintaining diversity. We know that didn’t happen. And we know that Humboldt was right. It opened with a talking head in a taxi, a 3D black-and-white talking head, Warren Ellis with his 3D beard sticking out at you, saying how awkward he felt talking about it as he never usually does in interviews, never usually does at all, and before he could get to his subject the right-hand 3D frame went out of focus and the film crew in the taxi stopped filming but the audio continued over a black screen as the scene disintegrated into technical talk and exasperation. Then another messy, behind-the-scenes scene with Cave in a dressing room, preening in front of a mirror, so the 3D was mostly depth rather than protrusion. The camera captured his entrance, and lingered as he combed his hair with deft flicks. The director asked if they could do another take. Why, what was wrong with that one? There was a degree of protest, as there would be, or it would not be Nick Cave being filmed, his vanity and privacy in conflict. Nothing was wrong, everything you did was great, we’d just really appreciate another go at it. This is a film which does a lot of lingering, and has a lot of interviews full of uncertainty and pregnant pauses. It verges on shapeless and it holds off almost its entire length from addressing its own subject (its only subject, as director Andrew Dominik says in this interview). This works because we all know, as it was in the news, and no-one watching it will not know. I suppose if you didn’t know, you’d wonder what everyone was tip-toeing around, and it would hook you that way. Nick talks in voice-over about going, for example, into a baker’s to buy, say, a loaf of bread, and one of the other customers in the queue says something to him that he doesn’t catch, so he says ‘What?’ too loudly and angrily, and the other customer says ‘We’re all with you, man,’ and he looks around and the whole queue is looking at him in sympathy and he thinks what nice people, ‘but when did I become an object of pity?’ Told not in recollection, but as a speculative scene that no doubt echoed many real ones. Narrative tricks to keep us on our toes. Listening to Skeleton Tree the following day I noticed two references to hanging around in supermarkets and wondered if the bakery had been an invention, an upgrade. I wondered if the place used in the film as the Cave house is the Cave house in real life, but I think it must be: Dominik talks about filming there, and the shutters are the same as the ones on the cover of Push The Sky Away. It’s a beautiful town house, spacious, white. Why the speculative mode, the ‘for example’, the ‘say’? Why not tell us about an actual visit to a bakery or supermarket? Isn’t this a documentary? It is and it isn’t. Imagination and storytelling must come into play. 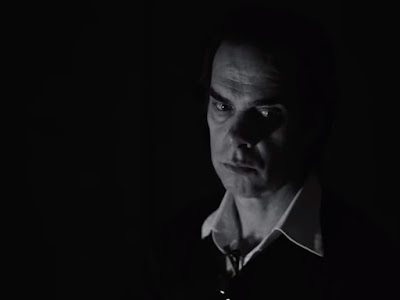 Those are the things Nick Cave does, the things that broaden lived experience into work that can have relevance for his audience. He surprised me by saying that this actually matters to him: of course it must, but to acknowledge it is a change from the Cave of the ’80s and ’90s, who would never have been so humble. He talked, too, about the shift away from narrative in his writing. He said he doesn’t believe in stories so much now, he’d rather layer things than have the beginning, middle and end of a single thread. Ah, so that’s why the film is so loose. He said that trauma leaves no space for imagination and creativity, still not saying what the trauma was. His wife Susie found the opposite, that throwing herself into her creative work (dress design) helped, gave her something other than trauma to focus on. Nick said he had to forget his previous perfectionism and let lines in that he would normally have discarded, so the looseness is presumably there in the record too. On first listen, the thing that struck me is how much of it consists of Warren’s soundscapes, with only a few songs, nearer the end, having full band arrangements, as though it starts at the bottom of a murky pool and by its end arrives at the surface, just as the film begins with mess and out-takes and gradually accumulates structure, eventually arriving where a more conventional documentary would have started, at a deserted cliff edge. It’s funny, too. Near the beginning, Nick’s scathing reference to ‘the 3D black-and-white camera’ which is dogging his steps, or objecting later on that Susie is being filmed emerging from the toilet (‘could you at least get the bowl out of shot?’); Warren’s reassurances to Nick that ‘Your hair looks great!’ or ‘Your hair is even better than it was before!’ This is a film about people getting on with things under the saddest of circumstances, and it goes to some lengths to focus on the getting on rather than the sad circumstances. The scene in which Susie shows and talks about a drawing Arthur did of the cliff where he died, years earlier (aged around 5), is not typical, and is more moving because of it. Nick sits at her side, silent for most of this scene. The most profound reflection, I think, was Nick’s description of the trauma as a fenced-off area to which they, his family, are bound by elastic, and they can carry on with life, but they will always be snapped back (here he snapped his fists together). The one doesn’t invalidate the other, but it colours it, changes it forever. There are some things from which one doesn’t, and doesn’t want to, recover.